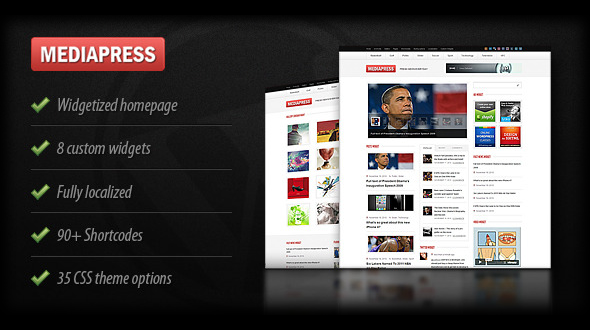 Mediapress is a News/Magazine theme. The 3 collumn on the homepage are completely widgetized and we created 8 custom widget for you to display your content. There is 90+ shortcodes wich are in the visual editor of WordPress and 35 options to change the CSS in the theme options (Font size, color, background colors etc etc) Mediapress is also fully localized so you can translate the theme really easily. Give it a try!